a dministrative assistant in December, 2018. She retired from the State of Illinois after working for 32 years as an administrative assistant and paralegal for the Illinois House of Representatives. Lisa received an Associate Degree from Springfield College in Illinois and a paralegal certificate from the American Institute for Paralegal Studies in Chicago, Illinois. Lisa enjoys cooking, reading, crafting, and most of all, spending time with her family. 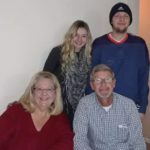 She and her husband, Larry, have been married for 23 years and live in Rochester, Illinois with their 2 children, Jared and Jordan, and their miniature schnauzer, Kibby. Lisa is very excited about helping to make a positive difference in the lives of children all over the world as part of the MAA team.